Lemina. Sturaro. Isla. Moise Niang. Rugani. Coman. They all look good playing in non-league Serie A where Juve wins by default. what have I been saying all along? yes, Ajax look good. But this Juventus team were never gonna win the tournament they've looked poor throughout. They aren't an elite team. It's Ronaldo and a bunch of numpties. If juve make a comeback from this, they deserve to win the entire thing. 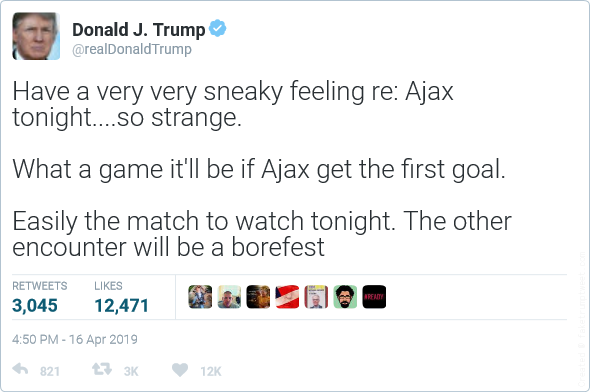 Ajax are gonna win the whole thing aren’t they. Neres u POS should have been 1-3 !!!!!!!! That miss is going to haunt Ajax. @Unique wrote: Ajax are gonna win the whole thing aren’t they. Hope they do tbh, don't care if they get ransacked in the summer just the idea of them ever winning the CL again after all the money coming into football i thought was a dead pipedream. Tactical genius EuroMax at it again. Spurs will finish Ajax easily lol. The thought of Spurs potentially being in the CL final is ridiculous tbh. @Firenze wrote: Spurs will finish Ajax easily lol. The thought of Spurs potentially being in the CL final is ridiculous tbh. Hold on Spurs/City will face the winner of this tie? Neres should have finished, there always one scrappy header goal in Ronaldo. Strange for some reason i thought they were facing Barca and Liverpool were facing Spurs/City lol. Spurs, City, Liverpool or Barca will all destroy Ajax. Juve must have the worst midfield amongst all the big clubs in Europe lol. Said it before as well. One man team.